This year, we’re showcasing how food connects people, and what makes life in and around the kitchen work in harmony. IKEA announced today that the new 2016 IKEA U.S. catalog, filled with new product offerings, home furnishing inspiration and smart solutions for every area of the home, will be available to the public starting this August. Themed “The Little Things That Matter,” this year’s catalog focuses on life in and around the kitchen and celebrates how food – and all the activity around it – brings people together. Readers can explore more than 300 pages for tips and ideas for everything from sharing breakfast-in-bed to preparing a big family dinner. There is so much more to food than just food. The growing interest in food is more than just a trend, so to better understand global attitudes toward food, IKEA recently released its second annual Life at Home Report (http://lifeathome.ikea.com/food). The report takes a deeper look at how food connects people and is shaping people’s everyday life. Today, more and more people care about what they eat, how they eat it, where it comes from, and how they can minimize waste. 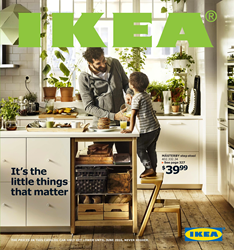 Within the catalog pages are many beautiful and affordable IKEA solutions for growing, cooking, serving and storing food, including IKEA kitchen systems, appliances, cookware, tableware and accessories geared to help make the most out of your food activities. These solutions allow people to focus on the tiny, magical moments that take place in and around the heart of the home. The 2016 IKEA Catalog will be available in 71 printed versions, 34 languages and distributed in 49 countries. IKEA is committed to sustainable practices, which is why the catalog is printed on 100 percent FSC® (Forest Stewardship Council) certified paper. Printed Version: Request a printed copy of the catalog at http://www.getmy2016catalog.com. Digital Version: Visit http://www.2016digitalcatalog.com to view the digital version of the catalog, where users can save their favorite products and create shopping lists. Catalog App for smartphones and tablets (iOS and Android): Download the free IKEA Catalog App for new inspiration and extended content including: a new “Walk in the Room” feature which lets users take a tour in two room sets; an augmented reality “Place in Your Room” feature which allows users to virtually place and view nearly 400 IKEA products in their own homes; 360° views that allow users to look all the way around a whole room; and additional videos and image galleries. NOTE FOR PRESS: Please visit our press site at IKEA-USA.com/2016catalog for downloadable information and assets, including the press kit, digital catalog, images, videos and more. For additional information, product loans or images, please contact us at: IKEARequests(at)Ketchum(dot)com. Join the conversation via the hashtag #IKEACatalog. Since its 1943 founding in Sweden, IKEA has offered home furnishings of good design and function at low prices so the majority of people can afford them. here are currently more than 360 IKEA stores in 47 countries, including 40 in the U.S. IKEA incorporates sustainability into day-to-day business and supports initiatives that benefit children and the environment. For more information see IKEA-USA.com, @IKEAUSANews, @IKEAUSA or IKEAUSA on Facebook, YouTube, Instagram and Pinterest.